Tyres on vans and light commercial vehicles (LCVs) lead a hard life, carrying loads or doing multiple drops, often in tough working environments. Rough ground or repeated kerb scuffing can cause levels of damage and wear way beyond that of a car tyre. As a critical vehicle component, it's important to carry out regular checks on vans of all ages to make sure their tyres remain safe and legal. With costs like fuel rapidly rising, businesses face increasingly tight margins and can ill afford the impact of any tyre-related problems such as vehicle downtime, missed appointments or repair costs. Regular checks can prevent these problems helping businesses to save both time and money. Van operators and business owners have a duty of care to their drivers and must ensure they are provided with a safe working environment, which includes the provision of safe and roadworthy vehicles. Since the Health and Safety Offences Act came into force in January 2009, UK courts have greater authority to prosecute businesses for committing offences such as fitting illegal tyres or faulty brakes. The maximum penalty has increased from £5,000 to £20,000. Equally, van drivers have a duty of care to ensure their vehicle is safe and roadworthy. Drivers found to be driving on illegal tyres face personal fines of up to £2,500 and three penalty points for each illegal tyre, irrespective of whether the van is company owned or not. 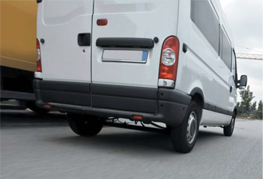 As vans frequently carry loads, it's essential that tyres are inflated to the correct pressure. When a tyre is under-inflated (or overloaded), excess heat builds up within the tyre, which greatly increases its likelihood of experiencing a rapid deflation. Tyre failure of this nature is a major safety risk as it can cause the driver to lose control of the vehicle, and can also put other road users at risk. Van operators should ensure that their tyres are inflated to the correct pressure depending on whether the vehicle is laden or unladen. Details of the correct pressures can be found in the vehicle handbook. Tyres are complex components that have been engineered to work in harmony with the van's braking, steering and suspension systems. When a tyre is under-inflated, it contains insufficient air to support the weight of the vehicle properly. This can adversely affect acceleration, braking and cornering, potentially making driving unsafe. By keeping tyres properly inflated, van drivers can travel further on each tank of fuel and reduce their CO2 emissions. Under-inflated tyres experience rapid wear in the shoulder area of the tread as more of the load is supported by this area. Driving on over-inflated tyres results in higher wear in the centre of the tread. Keeping tyres inflated to the recommended pressure for the vehicle and load ensures an even contact distribution and a more even wear rate, helping to make the tyres last longer. Adequate tyre tread depth is vital for vehicle safety. Vans are particularly vulnerable as their heavier mass means stopping distances are longer than those of cars. 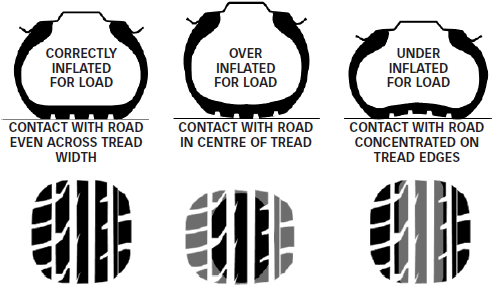 Insufficient tread depth can extend stopping distances even further in wet conditions. Current UK law requires that the tyres fitted to vans must have a minimum tyre tread depth of at least 1.6mm* across the central three quarters of the tread and around its entire circumference. Drivers found in breach of this law face a personal fine of up to £2,500 and 3 penalty points for each illegal tyre. It's simple to check your tread depth by using a 20p coin. If the outer band of the coin is visible when inserted into the tyre tread grooves, the tyre may not have sufficient tread depth and should be examined further by a professional. * For heavy vans above 3,500 kg maximum GVW (Gross Vehicle Weight), the truck tyre minimum tread depth of 1 mm applies. 1. 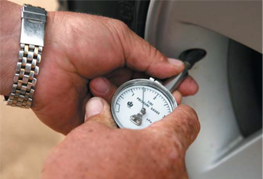 Use a reliable and accurate pressure gauge to check the pressure of van tyres at least once a month or before a long trip. 2. Check the pressure in all tyres not forgetting to check any spare tyre(s) as well. 3. Tyre pressure should be checked against the vehicle manufacturer's recommended operating pressures for the load being carried. 4. Check the pressure when tyres are cold or when the vehicle has travelled less than two miles. 5. When checking pressures, give the rest of the tyre a thorough visual inspection. Remove any stones and other objects embedded in the tread. Look out for any cuts, lumps or bulges. 6. If you are unsure on any aspect of tyre pressure or tyre condition take your vehicle to an approved fitting centre and speak to the experts. 1. Clean the dirt from the valves and make sure that caps are fitted to the valves on each wheel. 2. Remove any stones and other objects embedded in the tread. 3. Look out for any bulges, lumps or cuts to the tread and sidewalls as well as any evidence of surface cracking or crazing. Any damage should be inspected by a tyre professional. 4. Repairs to van tyres must only be carried out by a tyre specialist, and must be done in accordance with the current British Standards. 5. The suspension alignment should be checked and corrected as necessary if the tyres show signs of excessive, uneven or irregular wear. 6. Any unusual vibration or air loss must be examined immediately by a tyre professional, as these could be signs of potential tyre failure.